I may get a little choked up so be careful. I have now written four papers this semester about my volunteer experience helping grade schoolers with their reading and comprehension skills. Because of all that typing, I've really thought about what happened while I was in the classroom with the two children I was assigned to work with. Among other things, I have realized that children are cute, funny, in need of attention and leadership, and are not necessarily committed to learning. My experience with them has been a stark contrast to my experience with tutoring college aged writers. This doesn't mean I didn't have fun with them though. They would read books to me, and we would look at the pictures whenever they got bored to keep them engaged. I felt like a little bit of the magic that some of the books held for my kids rubbed off on me as we would read them. 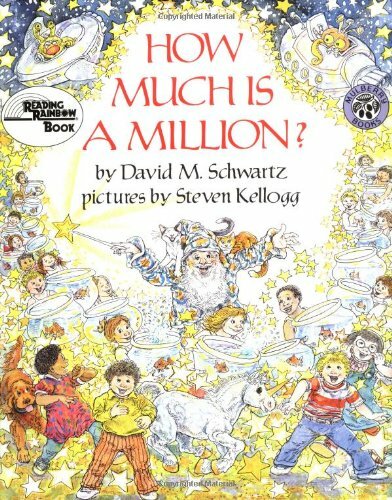 The last book one of my kids who I will refer to as A read to me was titled "How Much is a Million?" by David M. Schwartz and Steven Kellogg. This book was magical, as you can clearly see. We read about how staggering the numbers million, billion, and trillion are. The book's illustrations were vivid, creative, and adventurous. I felt that the book really illustrated the wonder of knowledge that I had been trying all semester to instill within A and the boy (here named T) that I worked with. I had been trying to cultivate a love of learning for A and T because I feel that a love for learning helps drive one's strivings for success. I feel like it would be so wonderful for them if they could sit down to read because they wanted to, if they were able to pick up their biology textbooks once they reached high school and could say "There is something fascinating in here and I'm going to find it." Maybe it's just the fact that I'm in college right now and love all the cool things we get to learn about or maybe it's because I'm a nerd, but I think the real reason I tried hard is because I want A and T to go to college. I want them to be studious and industrious. I want them to be like a lot of the students who come into the Writing Center: committed. I tried all semester to help them see the magic in books, the magic in facts, in the encyclopedia. I spoke candidly with them about the value of information and the value of committing oneself to learning. I hope it stuck. If any of you get the opportunity to tutor kids, I recommend it. This experience has helped me see more the value of what we do. As a tutor, I'm trying to increase a writer's academic competence and direction. I think that as we help students develop the tools they need to write a successful paper, we are improving their academic confidence, and helping them develop tools for success. Evan, what you have done for your service learning project this semester is beyond admirable. Anyone volunteering to attempt to teach young children that learning is important and can also be enjoyable could be labeled a hero in my book. There is no way to tell how far what you have implemented in these kids will go. The service you have provided to these children could potentially follow them for the rest of their lives, determining success in their high school, college careers, and even further. Though I’m sure that the kids you worked with gained an immense intellectual profit, it also probably goes without saying that you have gained just as much, if not more from the experience, though in other ways. I hope that you learned a lot about yourself and also about teaching children throughout the semester. I also wish that what you did gain can follow you for the rest of your life. It has been a pleasure engaging in the many insightful conversations that have taken place this semester both with you, and the rest of our classmates. Evan, I believe that by spending time with these kids, you have made history. Perhaps this kind of history won't be written in any text book, but it will be written in the minds and hearts of A and T forever. It is interesting because, as you stated, giving kids lessons in literacy isn't quite the same as assisting someone who is in any level of college. However, it is just as important, if not more so. If you can show someone at a young age that opening a book doesn't mean work but an adventure, then you've given them an incredible gift. Thank you for posting about your experience, because it is a reminder that learning can be and should be fun! Thank you for sharing your experiences. I too have had the opportunity to help children with the reading and writing skills. Some people do not see the importance in simply reading a child a book, but it can be a very rewarding experience. The challenges you face while tutoring children can be very interesting! The dynamic of a session is so much different from tutoring a college level student.